America's most expensive house is currently on the market for $250 million, and it is truly a turn-key millionaire, or billionaire, set-up. According to CNBC, not only does the house come with a ridiculous number of rooms, space, and luxury amenities including a bowling alley and movie theater, but it's also already filled with furniture, art, and, yes, vehicles. The news agency reports that 10 motorcycles and 12 cars are included with the property, as well as a helicopter – the latter from the 1980s adventure TV show Airwolf, no less. While the house's official website doesn't give a list of the vehicles included, CNBC notes at least one Rolls-Royce Dawn, a Ferrari 488, and two of the most expensive cars in the collection, a Pagani Huayra, and a 1936 Mercedes-Benz 540K. 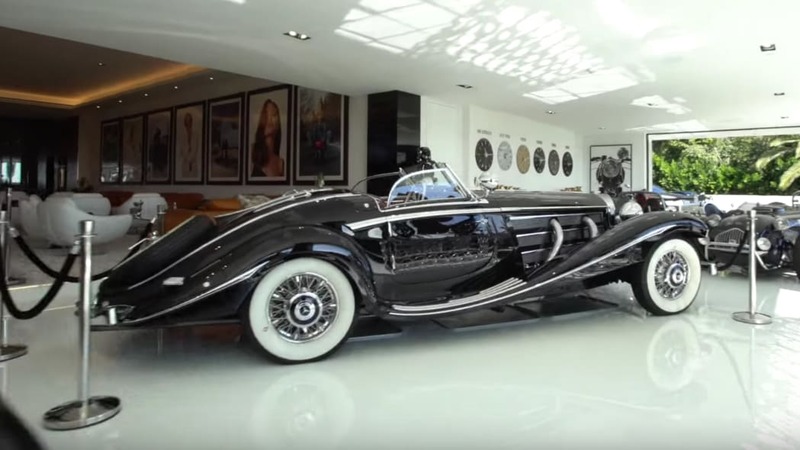 CNBC values the Pagani at $2 million and the Mercedes at $15 million, though that exact 540K last sold for $11,770,000 at Gooding & Company's 2012 Pebble Beach auction. We did manage to spot most of the rest of the collection, thanks to the video above. In the gallery garage is a Spyker C8, Ariel Atom 3, and some type of Allard. 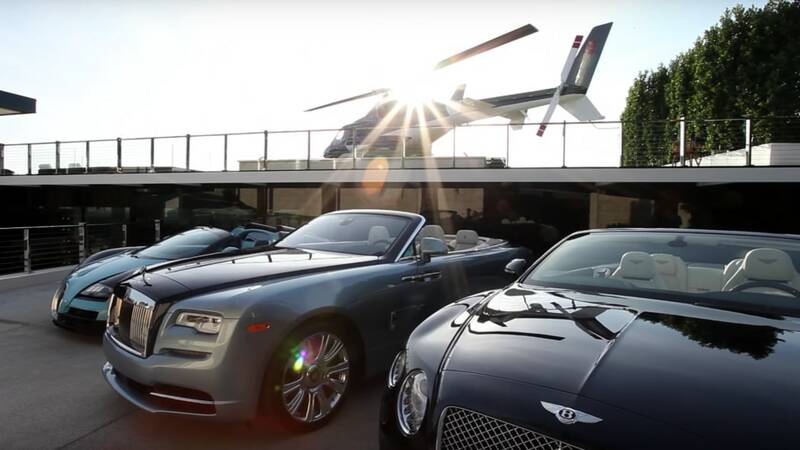 Outside is another Rolls-Royce convertible, a Bentley Continental GT convertible, and of course a Bugatti Veyron. Considering the open roof, it must be a Grand Sport. 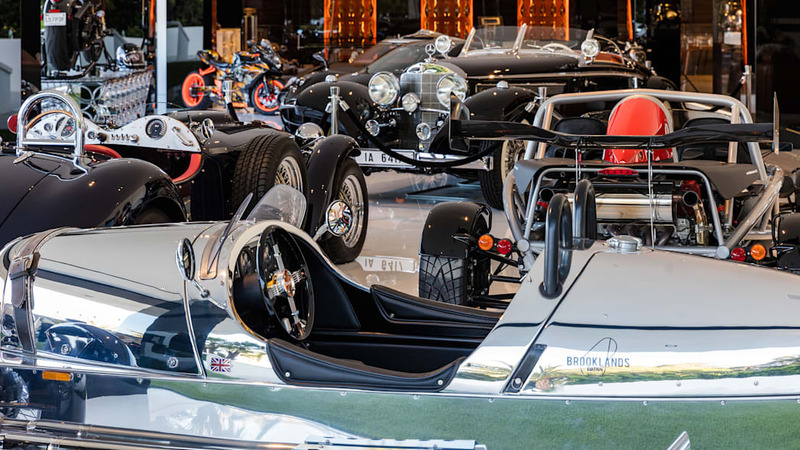 We also noticed in some of the photos that there's a Morgan 3-Wheeler in with the Allard and Ariel, too. By our count, we've managed to identify 10 of the 12 cars in the garage. We reached out to the home's developer for more details on the vehicles, and will update the post with any other information.